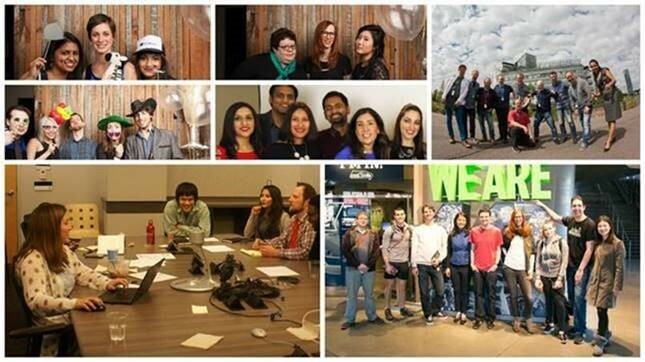 We are the Photos and Camera team and we are very excited to share with you some of the changes that our team has worked on—all because of your feedback! We’re constantly discussing your feedback and making changes to our apps based on this. We read the feedback you send to us in the Feedback Hub as well as Store reviews. Our process of reading the feedback includes meeting weekly in our living room and thinking about how we could best act on it. Our goal is to get you to love our apps as much as we do. 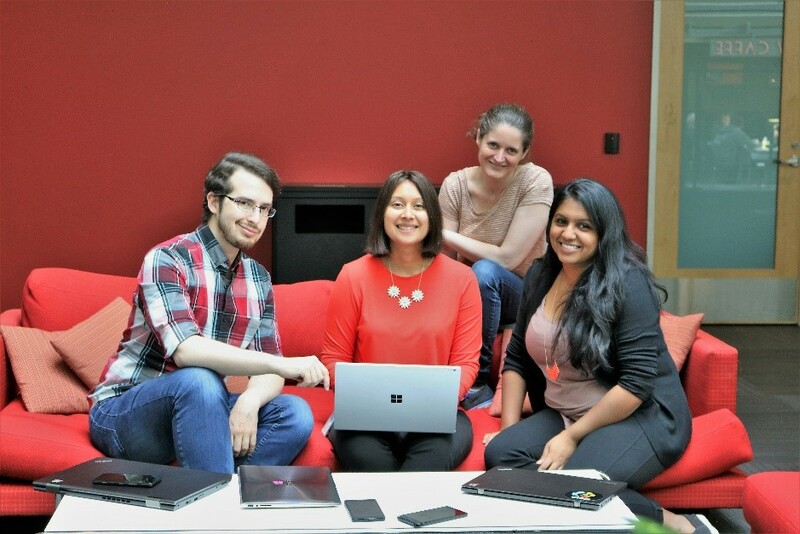 To help us get there, all of our engineers are required to spend time reading and understanding your feedback, and to dedicate their time working to find ways to prioritize and address your concerns. If you’re reporting a problem that has to do with a photo you took, provide an attachment of the photo in the Feedback Hub app and describe the specific problem you see with it. Include keywords that can help us find your feedback, like "video flickering," "finishing touches," or "living image." Report problems and suggestions individually—this makes it much easier for our engineers to prioritize your feedback. If you have a problem that you can reproduce in the Camera or Photos app, click the Begin monitoring button in the Feedback Hub and take the same steps you took before to make the problem occur. Once that's finished, return to the Feedback Hub and tap on Stop monitoring. Diagnostic logs are collected in this process that make it much easier for us to find and fix the issue you’re seeing. Please also check out Feedback Hub 101 for all the basics on filing feedback. On behalf of the entire camera and photos crew, we want to thank you for sending us feedback and pleasepleaseplease continue to do so! You can now pause and resume recording while shooting a video on PC and phone. This was one of our top pieces of feedback—check it out! It lets you capture only the moments you want in a single video. You don't have to take a long video and trim out the sections you don't want later, nor do you have to record different video files and stitch all the different video files together. In short, this is a way to virtually make "cuts" in your video while keeping it all in the same video file. As soon as you start shooting a video, you’ll see a new Pause icon appear near the Video button. Tap it to pause the recording. When you’re ready to resume recording, tap the Pause icon again. Finally, tap the Stop icon to end the video recording. 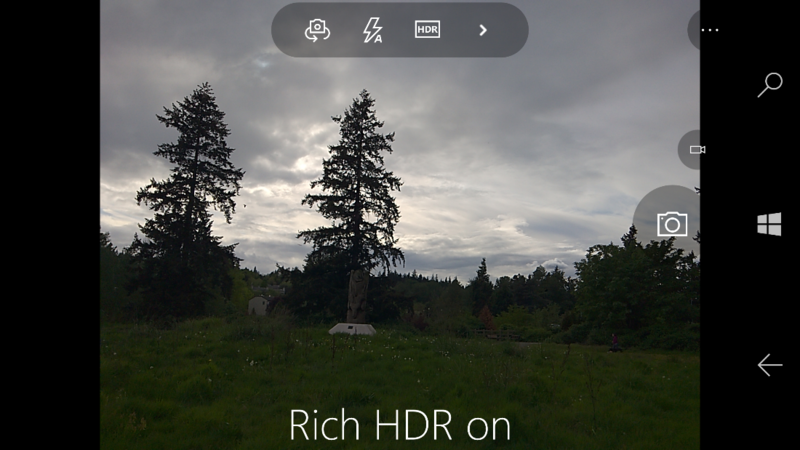 Quite a few people gave us feedback saying that they wanted to be able to manually turn on rich HDR in the Camera app on the phone, instead of relying on automatic mode to detect the right conditions and turn it on for them. We’re happy to announce that you can now turn Rich HDR to on, so you can take advantage of rich HDR whenever you want to. Since releasing the Camera app for Windows 10, we’ve been working constantly on improving its performance and accuracy. We’ve addressed concerns we heard about slow post-processing—this is when you go to review the photo you’ve just taken on the phone, and you sometimes see “Adding the finishing touches.” We’ve decreased the time it takes to add those finishing touches, and we continue to work to make this even faster in the future. Auto-focus is now faster and more accurate on the phone. 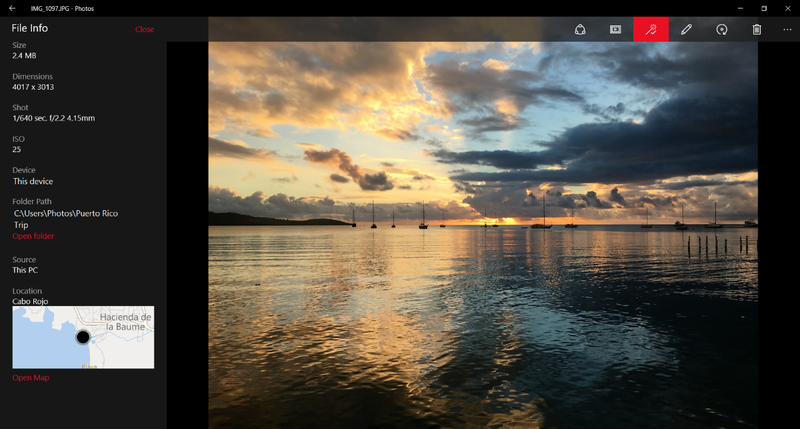 Since we released the Photos app for Windows 10, we’ve added over 20 features and fixed countless bugs based on what we’ve learned from your feedback. Among the things we've included are the Folders view, support for one-handed navigation on phone, animated GIF support, along with other updates that improve usability and performance. Performance is always top of mind for us when we build new features, and continue to work on improvements here. Deleting photos and videos is now faster on PC. 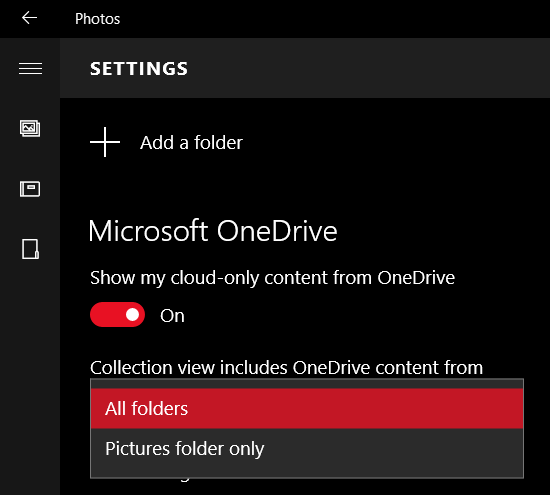 New OneDrive pictures appear more quickly in Collection view. Improved fluidity when zooming in on images on mobile devices. 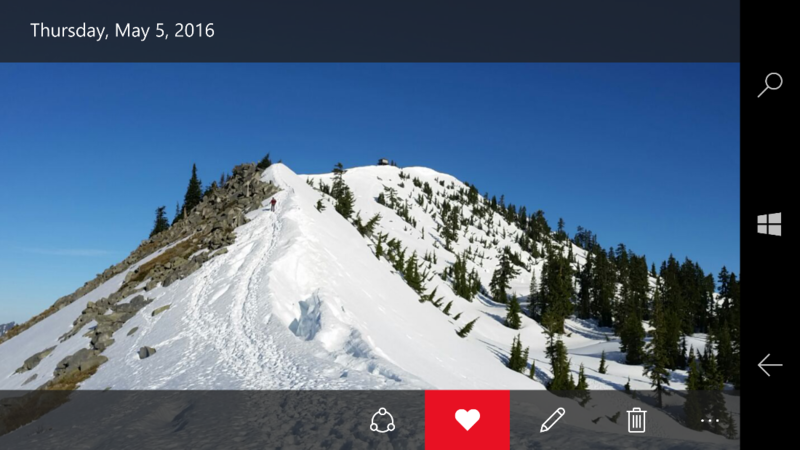 When you view your pictures, you can now easily set them as favorites and show them on the phone’s live tile. We received feedback about users not wanting to see the art from their OneDrive music files in the Photos app. To solve that, we introduced the capability to choose which OneDrive folders are shown in Collection view—either show All folders or just limit to the Pictures folder only. You can always find and change this option in the Settings page of the Photos app. 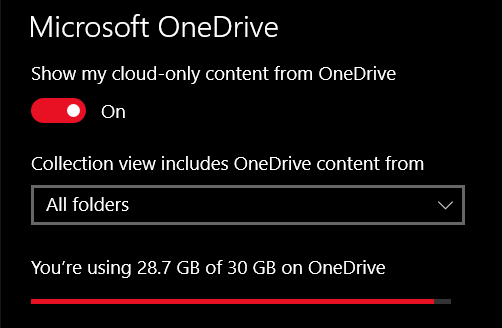 You can also easily find the remaining storage space available in your OneDrive from the Settings page. We added more print settings to help you choose exactly how you want to print your photos. 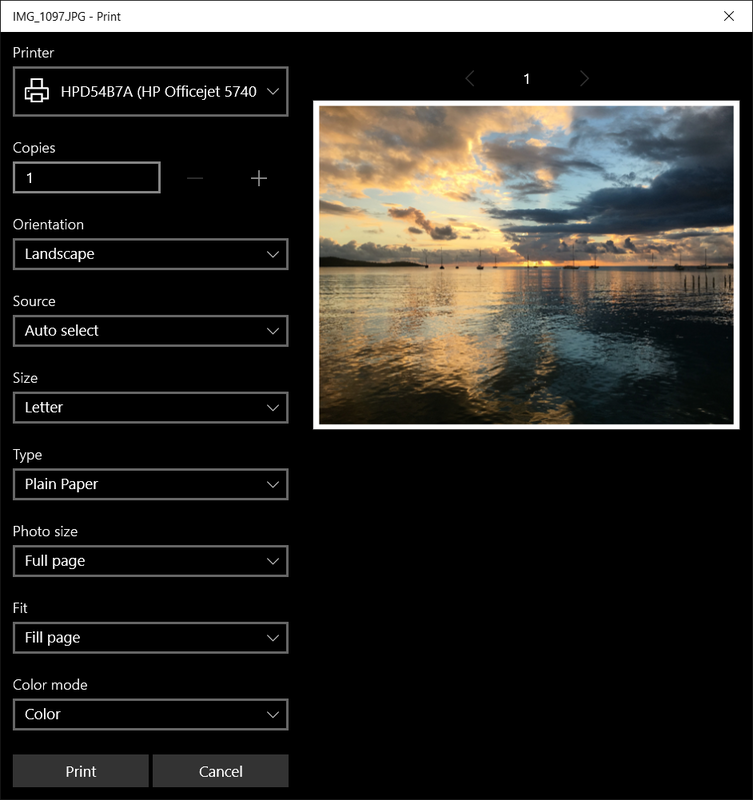 You can now easily print a 4x6 photo in portrait or landscape orientation to fill your photo frame, among other options. You can use the Photo Size field to pick from the various sizes (like 4x6, 5x7, etc.) and the Fit field to pick whether you want "Fill page," where your image may get cropped in order to fill up the printable area, or "Shrink to fit," where we fit the image to the printable area (you may get some empty spots on the edges if it isn't a perfect fit); both options respect the aspect ratio. Choose the destination folder when you import photos and videos. See the location where a photo or video was taken, while you’re viewing it. To see location info, open the file info pane. Either select the … dropdown from the app bar and select "File info" or use the keyboard shortcut Alt + Enter. You will now find the "Location" field, where you can see the location listed and a map showing the geographic location. You can even select "Open Map" to check out and interact with the map in the Maps app. You can leave this file info pane docked to the left side of your window as you navigate back and forth between photos and videos in your collection. 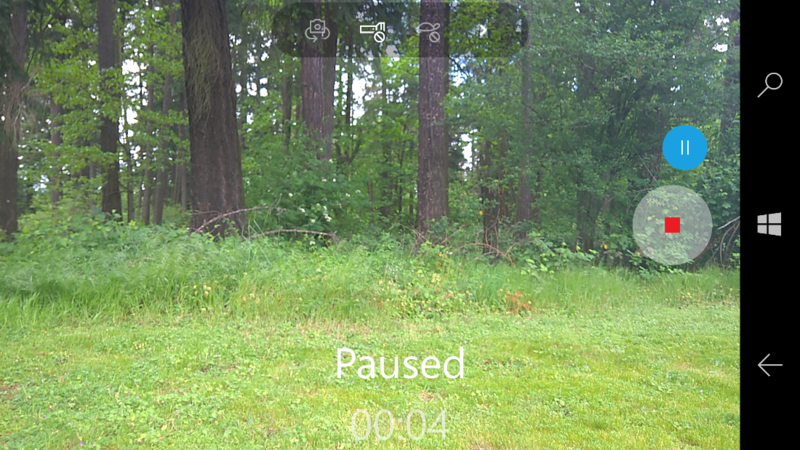 Edit slow-motion videos on your PC after taking them with a Windows phone. And of course, there are countless other small improvements and bug fixes being made all the time, many of them a direct result of your feedback. Thanks for all the great feedback so far! Please keep it coming—and we’ll keep working to make the Photos and Camera apps the best that they can be!